Hello friends! 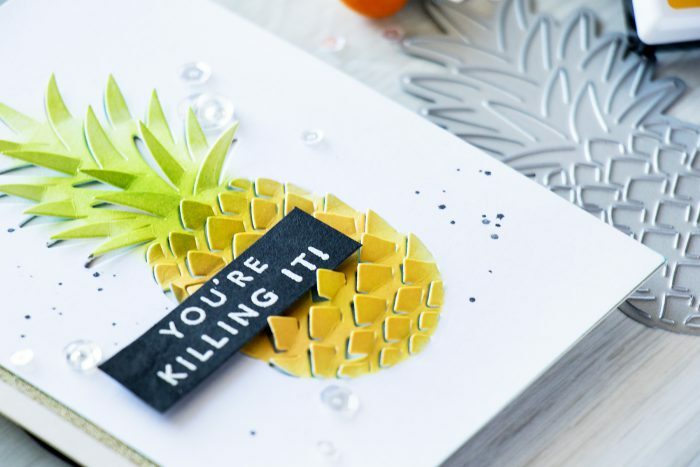 Pineapples seem to very hot right now and I’ve been wanting to create a card with a pineapple as a focal point for a long time, finally I have! 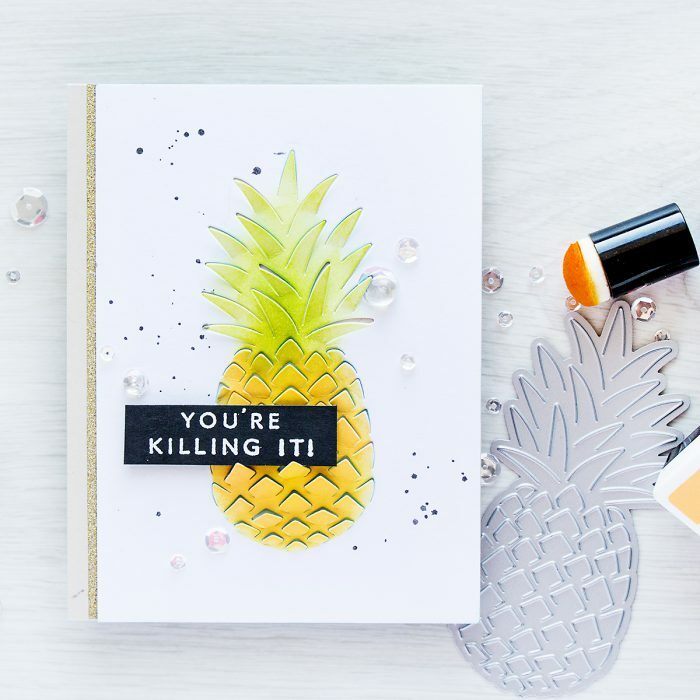 I used Hero Arts Paper Layering Pineapple die for this project. Paper Layering is a line of dies that makes partial cuts and allows you to have dimensional pop-up die cuts on your projects. Another favorite die of mine from this collection is Palm Tree, I’ve shared Paper Layering Palm Tree die a number of times already (here, here and here) and I hoping this pineapple die will be a frequent star of my cards, too. I started by die cutting pineapple in a panel made out of white cardstock. I wanted to add some color to this image, so I used Green Apple ink and sponged green onto the leaves, I used a piece of paper to slide under each leaf to protect the cardstock around it and keep it white. To add color to the bottom part of this image I die cut an identical pineapple image out of vellum, cut it out with my scissors, used the negative as a mask and applied Butter Bar yellow color to color it. Next I replaced the vellum mask (I made it out of vellum so that I could see what I was doing) and added little drops of silver spray ink from Hero Arts. It looks black in the photo as its very dark silver, it has a bit of shine too. The sentiment, You’re Killing It, came from Hello Gorgeous stamp set and was heat embossed in White embossing powder onto black cardstock. 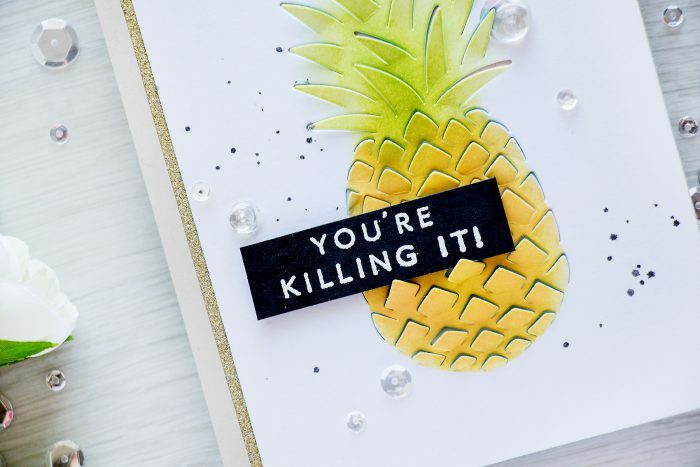 I adhered a strip of gold glitter paper onto a tan card base, adhered my pineapple panel and foam mounted the sentiment using black foam tape. I also added several clear sequins and drops to finish this card. Very easy to make and I think its a great one to give to someone to encourage them to continue working towards something. Cut a 3 7/8 x 5 1/2 inches panel out of white card stock. Die cut a paper layering pineapple image in the middle. Color pineapple with green and yellow ink using a sponge dauber, mask the area around pineapple to keep it white. Mask the pineapple and add silver ink splatter to the white panel. Create a top folding A2 card base out of tan card stock. Add a strip of gold glitter paper, adhere pineapple panel. Use tweezers to lift up each die cut section of the pineapple to add dimension. Heat emboss You’re Killing It or other sentiment in white embossing powder onto black card, foam mount over pineapple. Embellish card with sequins and drops. Great card Yana! I love this die, and the colors are perfect. Thanks for sharing and inspiring always. Yana, you’re always such an inspiration. This is so pretty. 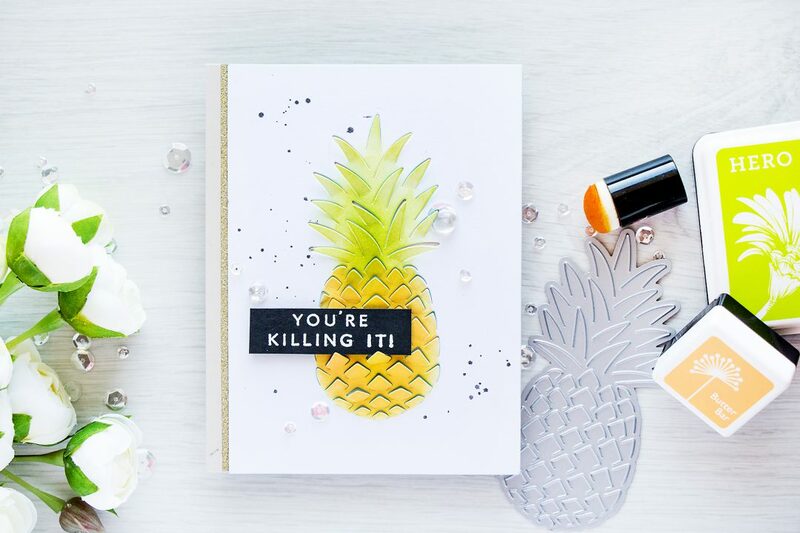 Who knew a pineapple could look so great on a card? Beautiful card! Thanks for explaining how you colored the pineapple. Yana this is so gorgeous!! Must try this idea!